Would have been a one episode season if I were in his place. @Whole Inn Juan, *Confessionals* "So she's 100% the girl I'm choosing, but I know the producers want to milk this, so the rest of the season is going to be like a bizarre version of Fear Factor." Now we know why he is a virgin. He's stupid and makes poor decisions. I'd propose to her in a second if she did that for me. Roll credits. She would of gotten my rose right then. Especially if she left it on during the honeymoon. 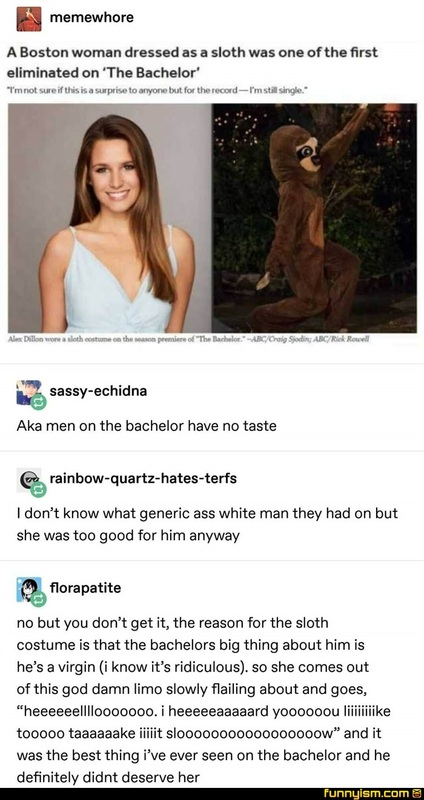 Ben Stiller produced a show that spoofed The Bachelor called Burning Love, and the first woman eliminated was a woman in a panda costume (plot twist, it was Jennifer Aniston) who said she wanted to be judged by personality, not appearance. We have officially tumbled into the f*cking Twilight Zone, when real life is imitating parodies. Guys guys, your hating on him for letting her go. But what if she had a really thick Boston accent. " Oh yeah, oh yeah, hardah hardah"
With that info mind, I can honestly see her doing that came off as mocking him for being a virgin and him not liking that. God forbid people not liking stupid jokes made at their expense! In another world this is my ideal woman. I say in another world because in this world I already have my ideal woman. It's a great idea, but she might be a furry. And that's a "Purge!!!" from me, Alex.